Read all about our live shows, restaurant, and venue! Prepare to be astounded by our amazing venue providing award-winning service, a wonderful pre-show dining, and a fantastic bar… but we’re also the home of some of the most sensational shows in town! 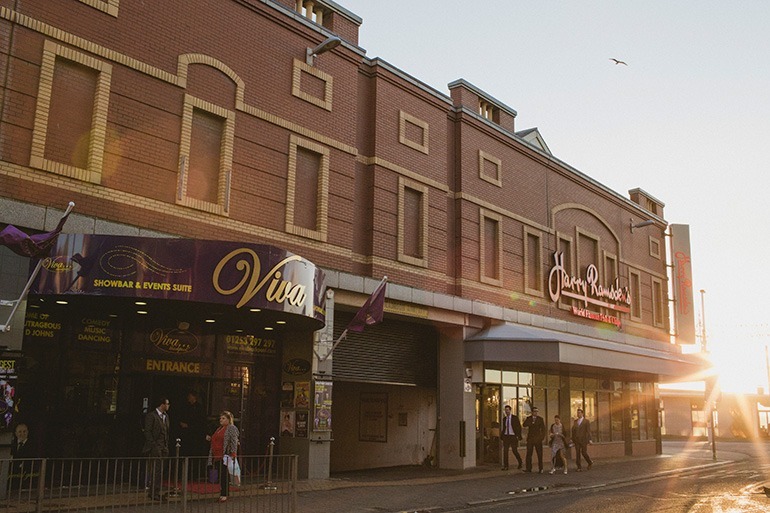 All of this is under one roof – that’s not a dream, it’s Viva Blackpool! Our amazing venue boasts three impressive rooms, each unique in terms of style and size, we’re open all year round and host a huge variety of in-house production shows, visiting performers, and impressive private events and parties. Check out our What’s On schedule to see what’s in store in the months ahead! of showgirl dancers, amazing vocalists, and our brilliant resident host and compere Leye D Johns. Our resident shows include ‘The Jersey Beats – Oh What A Nite!‘, ‘Viva Voulez Vous – A Celebration of the music of ABBA‘ and ‘Viva! The Vegas Cabaret and Variety Show!‘. ‘The Round Room’ is our intimate VIP bar space hosting the brilliant Viva Comedy Club every week – this is a plush room tastefully decorated with black and white images of Blackpool’s glorious past, with colour posters from the theatres which the town is famous for. And our ‘Festival Suite’ boasts a dedicated stage where many of our family show performances take place – including ‘High Jinx’ starring Michael Jordan – where the space is transformed into a circus tent of variety and magic for the night! With our unique location close to some of the UK’s most iconic landmarks, our venue hire facilities and options are second to none. We have a huge range of options available, and we can host specially tailored birthday parties, business meetings, and weddings all under the same roof. The Festival Suite is our indoor canopy marquee – hosting weddings, celebration events, private parties, and intimate show performances in an indoor marquee style pavilion which has to be seen to be believed. The Round Room is perfectly suited for private parties – and in 2019 we will be installing a self service Karaoke system which will ensure any party is started and the music is chosen by your own guests as they make it an occasion to remember with our help. Don’t forget, we also have fantastic food and drink available to compliment your event. Our talented chefs and restaurant team know exactly how to rustle up fantastic meals, including some of the best buffets you’ll enjoy! Our restaurant and drinks (including the option to pre-order drinks so they’re ready for your arrival) perfectly complement any event, so don’t forget to make your order. The team behind our venue are dedicated to ensuring your time with us is remembered for all the right reasons. At Viva, we have fantastic high score reviews on websites such as TripAdvisor, Feefo, Google Places, and Facebook. We’re also very proud to have picked up a few awards along the way having won Entertainment Venue Of The Year, Customer Service gongs, and an Entrepreneur Award at the Radio Wave Culture & Lifestyle Awards. Other nominations we’ve wrapped up include being a four times finalist at the LBV Red Rose Business Awards, a BIBA award finalist in 2018 and in 2017 we were awarded ‘The Large Visitor Attraction’ award at the Lancashire Tourism Awards. All of this lot makes us one of Blackpool’s premier, multi-award winning venues, and ensures you’ll enjoy an experience to remember! We really have to be seen to be believed, so don’t miss out. Get in touch to book your Viva experience right away!